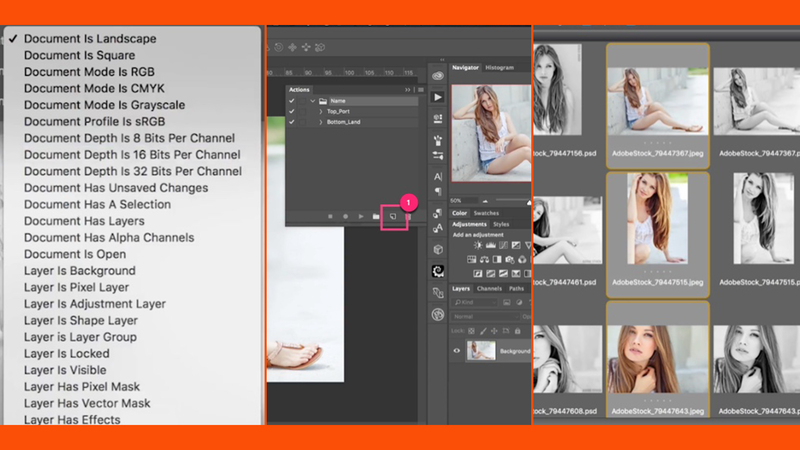 Conditional Actions have been available in Photoshop for a few versions and can save a great deal of time. The idea is that you can create a single action that calls other actions depending on a condition. For the Landscape images I’d like to have ‘Adobe Stock’ in the bottom right while portrait images I’d like the ‘Adobe Stock’ to be in the top right. In total I’ll need three actions, one for portrait, one for landscape and a third to call the right action. I’ll open a landscape and a portrait image in Photoshop and set my rulers to Percent by pressing ctrl(PC) or Cmd(Mac) and R to bring the rulers up then right click on the ruler and choose Percent. Extra Credit : This is an important step. Actions use the settings of the rulers to record where the words, logo or branding will be placed. If you have rulers set to anything else the placement will be placed at the same point every image. This is fine with this set of images, they’re all the same size but running this on different sized images would make placement seem ‘off’. Every Action needs to be placed in a group, so that’s my first step. I’ll open the Actions Panel, either from the Window Menu or by pressing Alt+9. With the Set created and selected I can now record my first Action. This now starts recording the action. This records exactly what I do now as a series of steps. For this set of images I’m going to create a ‘Look’ or tone for them and use an Action to apply this to all the images. Then, I’ll call the Top_Port or Bottom_Land actions from within it. For this example I’ve added a couple of Look Up Tables (LUT) to add a tone and Grey Scale look. You can see from this list, Conditional Actions can be very powerful.